While my goal is to focus on a variety of issues that veterans and military families face, I can’t help but feel led to carry the torch for wounded warriors. Being married to a wounded veteran has given me insight into a world that I didn’t really know existed. I’ll try not to harp on the issue too much on this blog as it’s meant to be all-inclusive, however, understanding the plight of the wounded warrior (those suffering with both visible and invisible wounds) is important and it can’t be ignored. In 2012, Veteran Affairs (VA) released a report with the staggering number of veterans who commit suicide each day: 22. You can see their full report here. Each day, twenty-two of America’s finest and bravest end their lives because they don’t know how to deal with their pain any longer. Twenty-two husbands, wives, brothers, sisters, moms, dads, sons, daughters, fiancés, friends, roommates, and battle buddies end their lives every single day. Twenty-two. 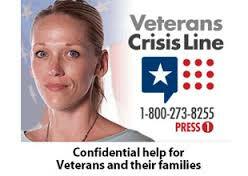 It’s hard to help a person who says that they don’t want help, but if you know a veteran who you believe is in crisis, they may need your help whether they want it or not. VA offers a number of resources for friends and families of vets. Don’t let your loved one become one of the twenty-two. Visit the VA website for more information here or call the Veteran Crisis Hotline at 1-800-273-8255 and Press 1. You don’t have to let your veteran suffer alone. You may not understand the things they’ve seen, the feelings they have, the hope they’ve lost, or the depression that consumes them but you can be there for them when they need you the most. If your veteran is experiencing chronic pain, depression, anxiety, insomnia, or anger they may need help beyond what you can offer them. Be brave enough to reach out for help on their behalf. Your veteran’s life may depend upon it. Recently, a friend posted a link to an article on Facebook about the Wounded Warrior Project (WWP). She asked if anyone else had heard anything similar to this writer’s opinion of WWP. I replied to her post and thought I would share it here, as well. I can only speak from my own experience so bear with me. I understand why many people are angry with WWP. To be honest, if I were to run an organization to help wounded warriors, I do not think I would do it the way WWP does it. HOWEVER, I have yet to see them do anything dishonest or illegal. Yes, their big wigs make a lot of money. Yes, they have a ton of paid employees. They don’t hide that fact. Unlike what the article says, I know many WWP employees who are veterans. A very good friend of mine from right here in Warren County is one of the soldiers featured in their commercials. They have done a number of amazing things for her and she gladly allowed them to use her story. No, WWP does not hand out cash to Veterans like some organizations do. They are not a financial assistance program nor did they ever claim to be. They have a number of programs in place and they serve wounded warriors through those programs. That’s their function. They set up healing retreats for veterans and their spouses. They have rejuvenation days for Caregivers. They host events for wounded warrior families to come together and encourage each other. They take veterans fishing and camping and hunting and to sporting events and other such activities so that they can be with other vets who understand what they’re going through and they can feel “normal” among their peers. They also have programs that help vets learn new vocations and place them in jobs. They provide writing clinics for spouses looking to improve their job skills so they can help their families. They offer peer mentoring programs so that vets can help other vets. To me, after reading this article, it sounds like the author was mad they wouldn’t let him sell his book at their table (which I wouldn’t do either if I was representing a large organization like WWP) and he got offended. I’ve heard a number of similar complaint articles from other vets who got their feathers ruffled because WWP didn’t offer to help them the way they thought they should be helped. WWP doesn’t claim to be the solution to every warrior’s problem. They have certain avenues that they provide assistance and they do a great job in those avenues. That’s my 2 cents worth. Yesterday I was blessed with the opportunity to go to a local spa with four other wounded warrior wives. For eight hours I was out of the house, away from my husband, and away from my kids. I love my family and every minute that I have with them, but eight hours on my own was definitely a treat. While I enjoyed my massage and my facial, I enjoyed hanging out with the other wives more than anything. My massage was scheduled an hour later than everyone else’s, yet these ladies (2 who I just met that day) waited until I was done to invite me to join them for lunch. None of us could get enough of the girl talk. It didn’t matter that we didn’t know each other before we entered that spa. We were military wives. That made us family. Even better- we were wounded warrior wives. That made us a family in a rare breed of military wives. The military provides such a sense of community, no matter where you are. As we sat at the table of a nearby restaurant, I looked around at the four ladies with me and thanked God for the bond that we shared. We drove in from all regions of the metro area. We brought with us different stories, different struggles, different strategies. We had unique personalities, unique positions, unique passions. But we shared the same heart for our husbands, the same hunger for harmony in our homes, the same hope for healing. We are sisters. This sense of community is not unique to the five of us that spent a day together at the spa. It is felt in restaurants and churches and living rooms across the world on military bases and in civilian areas, too. It’s lived out in chow halls and barracks and offices. It’s recognized in hangers and ships and MRAPs on the battlefield. It’s community. It’s family. It’s respect and loyalty and devotion. It’s the military. It’s who we are. It’s how we’re blessed. Life is full of adventures. Some that we seek out. Some that seek us out. My newest adventure is one that I have wanted to seek out for a long time but have been way too afraid to try- writing a book. As someone who has a huge fear of failure, I have lived most of my life quite safely in regards to attempting new things. I never try something unless I’m relatively sure I’ll be good at it. However, after much prodding from my college Lit teacher and that little voice inside my head that chants, I can do it!, I’ve decided to give this book writing idea a whirl. To pre-emptively combat any foreseeable excuses that I may conjure up, I enrolled in a Writing for Professional Publication course this semester at Arizona Statue University. Hopefully, with a little courage that I’m hoping to muster up and the skills that I’m expected to learn in this course, I’ll have what it takes to write this book and cross the biggest item off of the top of my bucket list. Time will tell.